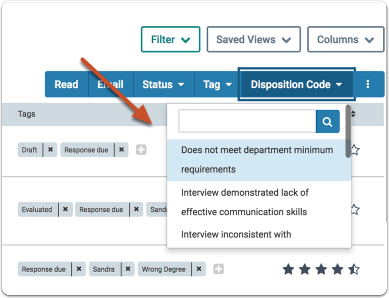 Disposition codes are short, pre-defined explanations of why an applicant did not make it to the next step of the hiring process. Disposition codes help track and document committee decisions regarding each applicant, providing responsible documentation of the hiring process and mitigating liability by keeping a record of the stated reasons why each individual job applicant was removed from consideration. 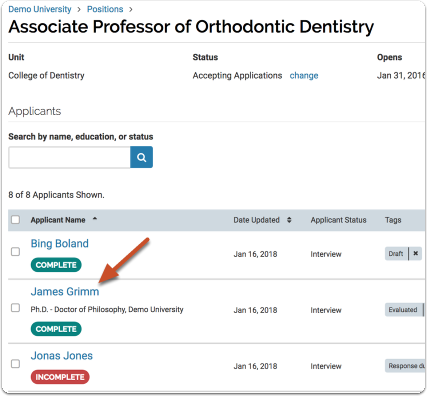 Administrators in Faculty Search can create disposition codes from the Faculty Search Administration page. Disposition codes created in the program are available to all units, and can be assigned to applicants by admins and committee managers. Note: If disposition codes are turned off for an institution, or not yet created, the user will NOT see options to add disposition codes when working in the program. Disposition codes are meant to work in conjunction with application statuses rather than replace them outright. Application statuses are meant to cover where a given applicant is in the committee’s process (e.g. Long List, Short List). Disposition codes, on the other hand, are intended to document why a given applicant did not move any further in the process. In many situations, these fields will be reported on together to support reporting at the end of a search. 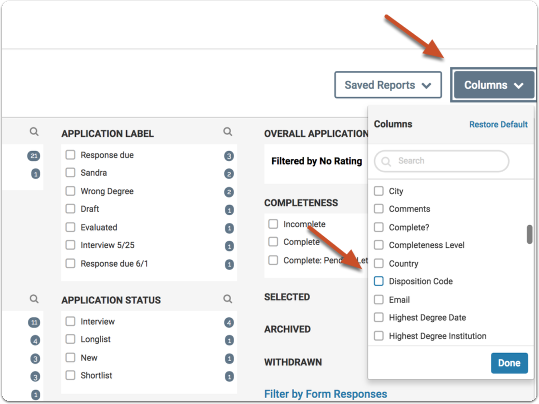 Using disposition codes for each applicant will help compliance reporting at the completion of a search. 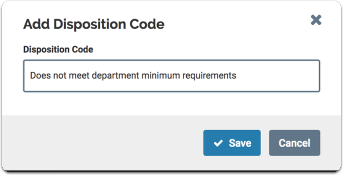 In many cases, it will help meet requirements for each applicant to have a valid code assigned to them. 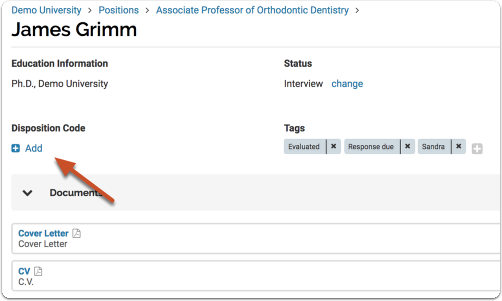 When used with a thoughtful final application status, disposition codes can become even more powerful tools for tracking applicants. 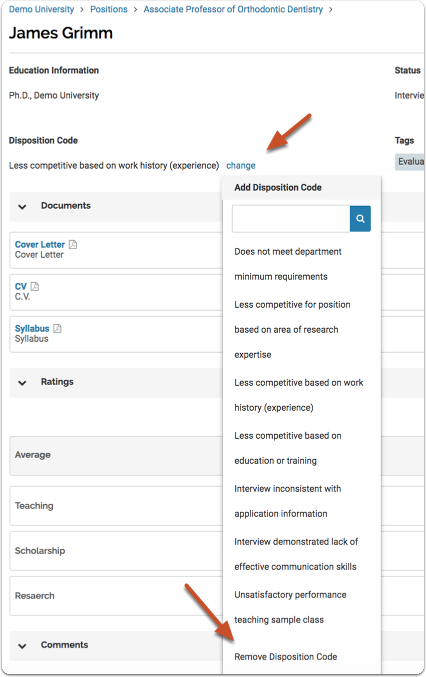 Disposition codes are created on the “Disposition Codes” tab of the Administration page. Text is limited to 100 characters. Disposition codes can be assigned to applications one at a time, or a single disposition can be assigned to multiple applications. 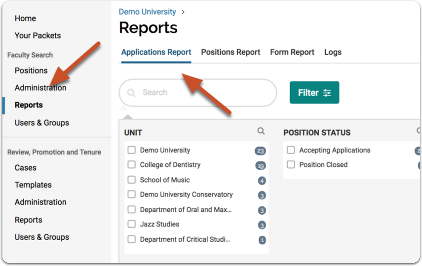 Select multiple applications on the applications page as shown below. This will open a menu bar that includes a "Disposition Codes" button. The code will display on the applicant profile page of each user. 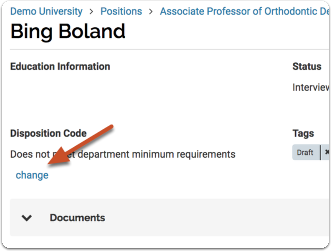 To remove the disposition code, scroll to the bottom of the list and select "Remove Disposition Code"
On the applications page, select the applications you want to change, click the "Disposition Code" button, and select "Remove Disposition Code." 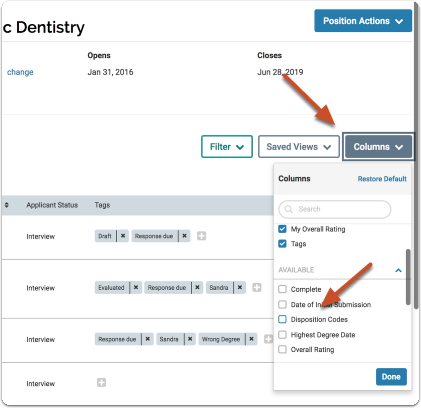 You can add a column to the applications page to display the disposition codes of applicants. 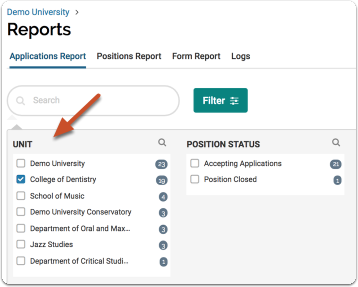 Click "Columns" and select "Disposition Codes"
Committee managers or admins in Faculty Search can create an Applications Report by selecting to add a Disposition Code column for reports on the applications list.